"Oh, Dakuwaqa!" 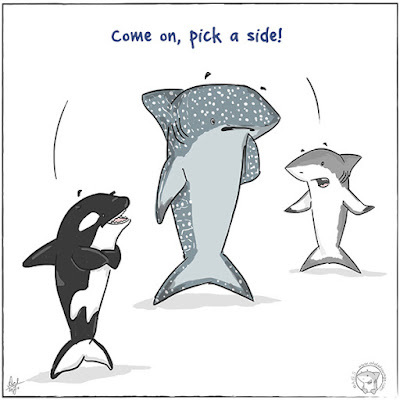 - The Shark comics and cartoons: Whale. Shark. Whale Shark. This is for 'International Whale Shark Day'. I posted a couple of old whale shark ones and wanted to do a new one. I ended up drawing two and this is the first one I finished colouring. I couldn't decided which whale I wanted to draw in this but since killer whales are probably my favourite "whales" I chose them. I apologise because technically they're classified as "dolphins". It would have made more sense if I'd used one of those harmless whales. I was also thinking that it would be nice if every day was an International Day for a different shark species. You know, each day gets its own shark. How special would that be? ps - In case you didn't know, whale sharks are sharks. They are fish and whales are mammals.